From top to bottom, we’ve included fabulous amenities inside your new Hillside Terrace Apartment home. For year-round comfort, your apartment has air conditioning and a wood-burning fireplace. You’ll love your new designer kitchen, complete with stainless-steel appliances, upgraded cabinetry, and kitchen pantry. Open floor plans make it easy to arrange your furniture any way you like. Bring the outdoors in from your private balcony or patio, complete with lovely views of our park-like grounds. 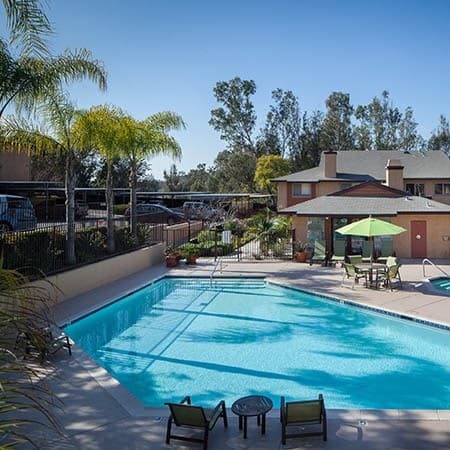 Discover Hillside Terrace Apartment’s lively community in Lemon Grove. San Diego is best enjoyed outdoors. For your relaxation, we have a fabulous swimming pool, sun deck, and hot tub. Grill with neighbors at the outdoor BBQ area and let the dog play at our on-site exercise park. The grand clubhouse features a 24-hour fitness center to stay in shape and laundry facility to keep everything fresh. One of our best amenities is our central location to Lemon Grove restaurants and shops. I-94 is less than a mile away, putting you within easy reach of the greater San Diego County region. View of our photo gallery and see all that we have to offer at Hillside Terrace Apartments. Call us today to schedule a personal tour of your favorite floor plan.